I was there for the CCG madness that followed in the wake of Magic's success. There were a number of games I got in on: Jyhad, Heresy, Vampire, Rage, Netrunner, INWO, L5R, Middle Earth, Star Wars, Battletech...I'm sure there were more. Some of them I actually dropped a bit of cash on before losing interest in. Some (Galactic Empires, Over the Edge, Super Deck!) I was able to get a fair amount of cards for really cheap but never really got into. But these are the real oddballs. These are games for which I only have one card, or very few. Perhaps they were promos from InQuest, Scrye, or other magazines. Maybe I picked them up at cons. No clue. Join me, won't you, in my CCG Dead Letter Office. EDIT: after doing some scans and uploads, you can now see some of these awesome cards! Let's see. To start I have four cards from something called Ani-Mayhem: Grab 'n Run, Punch/Lovely Hair (it appears to have two uses), Sudden Stop, and Kids These Days. The grainy screencaps on these cards are from, in order, Project A-Ko, Tenchi Muyo, Dominion, and Dragon Ball Z. I believe this game predated Dragon Ball Z mania in America. I have a fair amount of cards from this game, as I'm a huge Star Wars fan, and so are my friends. None of us liked this game, though. The ultra-rare, unbalanced special characters were the biggest turnoff -- who wants to buy a Star Wars game just to have Jawas fight random Imperial guards? Bleah. Also the idiotic combos: "Han's Back" gets Han from the Discard pile! If you don't have a Han, too bad! You got a worthless card! So I didn't play it. I doubt I have any worthwhile cards, since none of the ones I have are any characters you would romtely have heard of. The one I'm looking at here in the Dead Letter Office is a Japanese text card showing some guy in an X-wing getting blowed up. JYHAD. Not Vampire. Got into this right away but every time we played it we pretty much just wondered why we weren't playing Magic instead. It seemed at the beginning there were three decks you could build, and then play rock-paper-scissors with them. I got rid of all of my cards long ago except for ".44 Magnum" and "Effective Management". No idea why I have these two except they're both Ne Ne Thomas art and I have a friend who loves her stuff. Maybe I meant to give them to her. I have a Tomb Raider card called "Lil ol Me?" featuring Lara on a "beach" wearing a bikini and holding a gun. Totally hot if you get off on bad computer graphics. It prevents "Non-Lara Tomb Raiders" from attacking you if you are Lara. I refuse to believe anyone ever played this cheap-looking crap. I got four cards here from the Highlander TCG. I'm one of the three geeks in the world who doesn't place Highlander in their all-time top ten movies. The cards I have here are "Unholy Alliance" (featuring...a helicopter? ), "Dodge (Duncan MacLoed), and two of "Inquest", except they're not the same card. Oh wait. One is "InQuest" and one is "Inquest". I think at least the former was a magazine promo card. Two cards from the Deadlands CCG. "Raymond Armstrong" and "Eureka?!?". 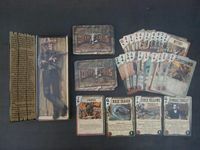 The latter has a zombie dog on him, and from the text of the card it seems that the discard pile is called "Boot Hill" which I think is great. Next up are two cards from the Aliens vs Predator CCG, which came out years before the movie. We got here a Chest-Burster in all its vile glory (flavor text: "It gestates inside a human host." Indeed!). Also "Small Arms" ("Old fashioned projectile weapons. Some things never go out of style.") Wow, it's like I'm right there, fighting aliens and stuff. These cards are bland and boring. One card here from Gridiron Fantasy Football: "Kick Return". There are eight lines of text on this card. If you play this game and have been unable to return any kicks, I got what you need right here. I never played this but I remember it had the same issues as Star Wars: ultra rare characters and useless cards. They made these "warp packs" available that supposedly gave you the cards to make just about any starter deck playable. I got one, even though I didn't play the game. It comes with a dozen cards: Gorta, Neutral Outpost, Yellow Alert, Montgomery Scott, Countermanda, Sensitive Search, Study Stellar Collision, Excavation, Test Mission, Investigate Anomaly, Relief Mission, and Study Plasma Streamer. I think that's the names of the cards: it seems to be a crapshoot where the name is going to end up on the card. I've always dreamed of having Scotty team up with Gorta to Study a Plasma Streamer. I really must stress that I didn't pay for any of these cards. They were promos or freebies I somehow got my hands on. I feel I must make this clear as I dig out two cards from Killer Instinct: "Rule the World!" and "Fireball!" I don't know if every Killer Instinct card name had an exclamation point at the end, but these two do. The copyright on these cards is 1996, three years before the Tomb Raider ones, but they look just as cheesy. I have four of these: Fairchild, The Curse, Savage Warblade, and Hazard. Each card has a stirring quote from the character that signifies that character's personality. Fairchild's is, "I'm on my way!" The hell? Savage Warblade: "Your friends are dead meat!" Wow. No wonder these are such memorable characters. Speaking of Todd McFarlane (The Curse, above, is one of his), here are two of the same promo for Power CARDZ. They are an "enhancement" called "Blast Big Hole". Where I'm from, blasting a big hole in something doesn't "enhance" it. It'll stun any Spawn for 3 combat phases, which is good. I'm allatime needing to stun Spawns. God help me, not only do I have a starter deck of this, I believe I actually paid otherwise useful money for it. I don't remember anything about this game other than it was based on one of the more unpopular RPGs from White Wolf, Changeling. Small wonder it never went anywhere. This card is labeled a Waylay and is called "Wandering Imp". Four (why is it that I always have four of them?) 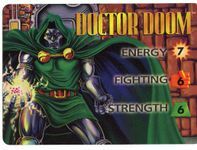 cards from this game, which I never heard much good about: "Captain Universe", "Doctor Doom", "Confusion", and "Alien Creature Rampages!" None of these four cards look like they're from the same game. If there's anyone out there who appreciates football more than I do, it's...well, pretty much everyone. So I can't tell you much about this trio of football players: Glenn Parker, Michael Haynes, and Martin Mayhew. There are stats all over these cards, and I assume you match them against each other. Four (!) cards from this game, though two of them are the same. I have two "Nyean Assassins", plus "Orb of Orlow". The final card is "Sarah's Sister" who is some kind of warrior angel. Get it? Like the Serra Angel! Ho ho! Hem. I need to scan this one: "Golgotha the Warrior Princess". If you can get past the thorns and claws, she's got her "headlights" on "high beam". Hubba hubba! You should know, though, she may never participate in a Shoot combat or be in cover. So there's that. I had to look this one up by the publisher, since there's nothing on the card itself saying what game it's for. It's the exact card in the picture here, Wyrm of the Crags. I can't tell you much about it. I got here the "Bow of the Glade" and "Mranth Orcs". I know this is one of the constant contenders for "Worst CCG Ever" and there's not much here that leads me to believe it's overly exciting. These cards are boooo-ring. The Boris Vallejo art on these three cards is SO unbelievably corny. I have here "Strength Bonus" (which is the most hilarious of the three), Atum's Twins, and Brak the Brave. The artwork is obviously recycled and just goofy. I gotta scan these things. I understand this religious game still has a pretty big following. I think they changed it away from a CCG, which I'm sure helped. I have here "Antidote" which renders all poisons harmless, and "Obedience of Noah" which I don't know what it does. I'm running out of stuff to say. This is from Battlelords, which I know nothing about. I believe this card is called "Gun Running" but there's text and numbers all over the place, so it's hard to say for sure. Ha, what a joke of a game. The card I have here is "The City of Phlan". It cannot be attacked by monsters unless Zhentil Keep is somewhere in play! Also, this city is immune to offensive cleric spells. So if you were thinking of casting Holy Light against the City of Phlan, think again, buster. This is one that, for others, has endured. It's based on the RPG Feng Shui, which I really like. I have "Silver Band" and "Ancestral Tomb". I'm honestly not sure why I never really tried this one out.